Two of our favorite working canines, Luna and Strider, display the two different types of service vests. Nowadays, dogs hear for those with hearing loss, detect the onset of seizures and low blood glucose episodes, calm the mentally ill and more. There are many jobs canines can do, and they all assist their handlers/owners. Common categories of helping dogs include service dogs, emotional support animals and therapy dogs, and there are distinctions between them. Service dogs are not pets. Rather, they are trained to do work and perform tasks their handlers are unable to do because they have a disability. These dogs work as part of a team with their disabled handlers. They keep their human teammates safe and help them achieve a greater level of independence. The Americans with Disabilities Act protects the rights of individuals with disabilities who use service dogs. The law enables these individuals to have their dogs in places where pets are normally not permitted, places like stores, restaurants, hotels and hospitals. The Fair Housing Act is another piece of legislation that protects people with service dogs. Under this law, a landlord cannot discriminate against those who have service dogs, even if they have a “no pets” policy. The Air Carrier Access Act allows for service dogs to stay in the cabin of an airplane with their handlers. People with disabling mental illnesses often use ESAs for emotional support. In these cases, their doctors provide letters supporting the use of the animals for the patients’ comfort and wellbeing. The letters qualify the patients to have the animals in their homes and on airplanes. ESAs are usually pets, are not specially trained and are not guaranteed the same freedoms as service dogs when it comes to entering facilities such as stores and restaurants. Some facility managers or owners might grant permission for ESAs to accompany their owners, however. Finally, therapy dogs are pets that have been specially trained to accompany their owners to places such as hospitals, schools and nursing homes to assist and cheer up the patients or children there. Essential components of a therapy dog’s training are obedience and socialization. These points are emphasized to make sure the dog remains calm and friendly with the strangers it encounters. Following training, therapy dogs are generally tested, registered and insured before being taken to a facility. While therapy dogs visit places such as hospitals and nursing homes, those visits are arranged with the facilities ahead of time. Therapy dogs don’t have the same rights as service dogs to accompany their owners in places pets are not permitted. 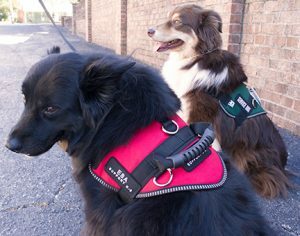 Dogs in these roles – service dogs, ESAs and therapy dogs – generally wear a scarf or vest indicating they are on the job. Don’t approach or pet them (service dogs in particular) without the owners’ permission. There are many ways dogs help us. Let’s help them, too.